Description: Researchers whose work focuses on the Psalms of Solomon, experts on the Septuagint, and scholars of Jewish Hellenistic literature take a fresh look at debates surrounding the text. Authors engage linguistic, historical, and theological issues, including the original language of the psalms, their historical setting, and their theological intentions, with the goal of expanding our understanding of first-century BCE Jewish theology. 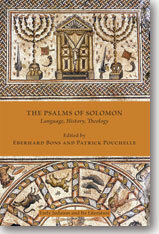 Citation: Felix Albrecht, review of Eberhard Bons and Patrick Pouchelle, eds., The Psalms of Solomon: Language, History, Theology, Review of Biblical Literature [http://www.bookreviews.org] (2019).